Bowling pin shooting is a shooting sport (primarily for handguns) in which the competitors race against one another to knock standard bowling pins from a table in the shortest elapsed time. Pin shooting is often described as one of the most enjoyable shooting games and one of the easiest means of introducing a new shooter into regular competitive shooting. Pinshooting appeals to both genders. There are many female pinshooters and many distinguished female pinshooters. See below for More Info on the matches at Sanner's and our Upcoming Events. We are always looking for sources of inexpensive used bowling pins. Contact the Match Director if you know of where we can get some. Five bowling pins are spaced evenly apart on a 4x8' table 7 yards from the shooter. For minor power factor (.380-.40cal) the pins are placed one foot from the rear of the table while major power factor (over .40 cal) are placed three feet from the rear of the table. The competition pins are used bowling pins from bowling alleys after they have reached the end of their useful bowling life. The pins react randomly, particularly to off center hits. Thus accurate bullet placement is important. After a string has been started any firearms/ammunition malfunctions are dealt with on the clock and are not reshot while any range equipment failures will permit a reshoot. 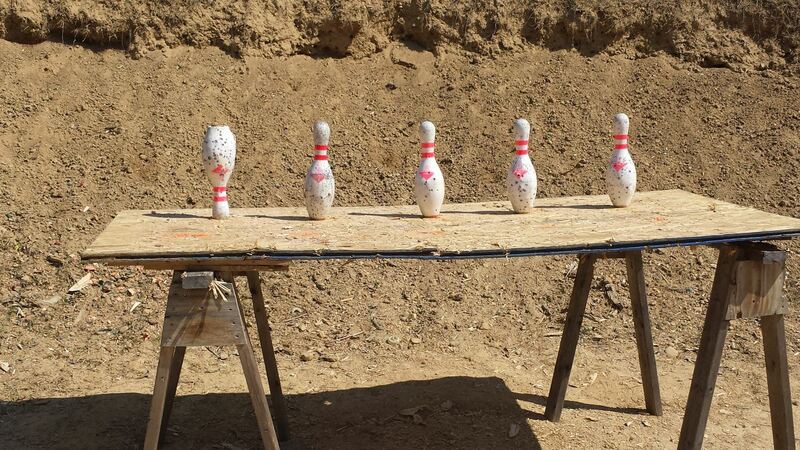 4th Saturday of the Month; Year Round - in the winter months the steel poppers may be shot in lieu of actual pins as the pins tend to shatter in the freezing temps. Minor - .380 - .40cal - Pins one from rear of table. Major - over .40cal - Pins three feet from rear of table. Open - None iron-sighted guns including revolvers. Pins set same as Major Division regardless of caliber. Ammo (minimum of 20 rounds required per match but rarely does anyone clear all the pins each time with one shot a piece so suggested 50-75 rounds per match). No magnum loads permitted. Entire squad shoots first string prior to moving on to next string. Shooters are allowed to reload during a string. Each string is timed separately. The range officer starts the time with a shot-timer. The score-timer records the final time as when the last pin clears the table. Failing to clear all the pins will result in a DNF for the string and no time. Top two strings for each match are totaled for a final time. There is no official organization oversight for bowling pin matches and rules may vary slightly from club to club.